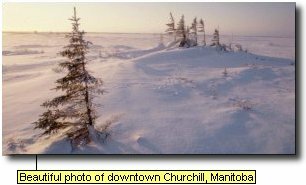 The CCK's central campus is located in the pristine and bustling metropolis of Churchill, Manitoba. For years, Churchill has been the meeting place for the world's cultural, social, and financial trend-setters, and it was obvious to us that it would make a tremendous amount of sense to have the CCK based out of Churchill rather than, for example, Paris, New York, Tokyo, or Moose Jaw. To get to Churchill, you have many options. One is by dog-sled. The other is by moose-back. Initially you may be a bit uncomfortable with riding a moose, but trust us, you'll grow to enjoy it so much that you'll wonder how you ever got around without one! Another wonderful aspect of Churchill is its abundance of polar bears. The CCK has been intrigued with their intelligence and curiosity for years. Who would've guessed that they can open doors with their paws? Well, after the spring of '83, the residents of the east wing of the CCK found that out, let their souls rest in peace!